United States international Antonee Robinson signed a new three-year contract with Everton on Friday but will spend the upcoming season on loan at Wigan. Robinson, 20, came up through Everton’s academy but has yet to play for the Toffees’ first team. The left-back spent last season on loan with Bolton Wanderers, starting 26 games, and will return to the Championship with the Latics in 2018-19. “It feels great to know that Everton have faith in me with this contract,” Robinson told U.S. Soccer’s website. “Even though at the minute they feel I might not be quite ready for the Premier League with the team they have, they do feel I’ve got a future with them. They just want me to get loaned out and get that experience. Robinson said he chose Wigan over a return to Bolton because he thought Latics manager Paul Cook’s tactics would give him more opportunities to get forward. 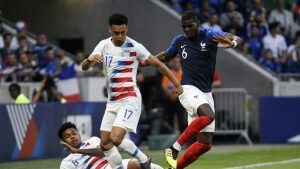 Robinson impressed in his first two appearances for the U.S. national team in friendlies earlier this summer, starting in a win over Bolivia and a draw with eventual World Cup champions France.